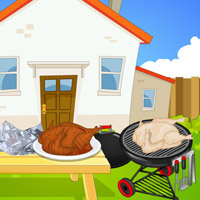 Thanksgiving Turkey Shoot is a type of shooting game created by games2dress.com. In the time of thanksgiving, you decide to kill as many turkeys as possible. But the news was spread all over to all turkeys. All the turkeys are planning to escape from you. You sarted shooting the escaping turkeys with your gun. Don't leave more than 10 turkeys it will end your game. 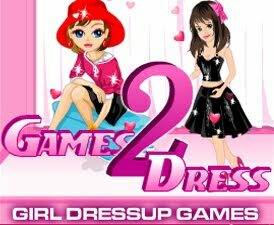 Collect the dead turkey flesh to get more score. 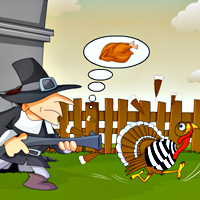 Shoot the turkeys and enjoy the thanksgiving with this game. Delicious Thanksgiving Turkey Cooking fun! You and your friends organized a picnic during the Thanksgiving day. There is a responsibility for you in picnic, roasting the turkey for you and your friends. So make your turkey taste just like grandma's. Have a fun. It's Thanksgiving festival season! You have renovated the food shop to attract the kids with some seasonal turkey food. 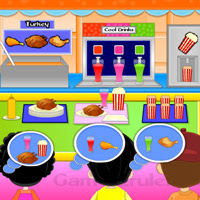 Earn money by serving the food according to kids wish. Watch the kid's waiting time and serve them accordingly. Operate the food machine to make the food correctly. Happy Thanksgiving Have Fun!